Gardening in sandy soil can be a challenge. When it rains, the water drains through immediately. When you water, you may as well aim your hose at a sieve full of marbles. My sister is a Master Gardener in northern Michigan. She lives on a grass-covered sand hill. When she started her garden, she could leave a hose running under a shrub for an hour, without even a hint of a puddle. The soil stayed dry 6” away. If I tried that in unamended California clay, I’d have a pond for a couple of days. We’ve worked out two fixes for gardening in sandy soil, but before getting into them, take a moment to consider some of the advantages of sandy soil. Root Crops—like carrots, beets, radishes, and other tap-rooted vegetables—perform much better in sandy soils than in clay soils. It takes a lot of work to bring clay soil up to the kind of tilth that favors root crops. Herbs, which need good drainage, often thrive in sandy soils. Root Rots that plague gardeners working in clay soil are almost non-existent in sandy soil. No Phytophthora for you. So the first trick of gardening in sandy soil is to take advantage of the strengths of sandy soil: loose texture and good drainage. Choose fruit and vegetable plants that need fast drainage. Bramble berries, herbs, and root crops are all good choices. If you try to adjust the soil texture by adding silt or clay to a sandy soil, you’ll see some improvement, but most of it will just flush through the soil. There’s not enough organic matter to keep these fine-textured soil components from washing out. Increasing soil organic matter is the key to gardening in sandy soil. You have to make the soil more “sticky”, so water and nutrients don’t just flush through every time it rains. You do this by making the soil more hospitable to bacteria and fungi. Bacteria and fungi will provide the glues to bind your sandy soil into something much better. How do make sandy soil more hospitable to bacteria and fungi? By adding organic matter. The best type of organic matter to add? Compost. Bio-char. Coir. Bacteria need moisture and nutrients to multiply. Both are in short supply when gardening in sandy soil. 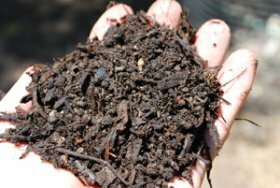 Good garden compost is loaded with diverse populations of active and dormant bacteria and beneficial fungi, as well as residual bacterial and fungal “glues” that help bind sand particles together, while soaking up and holding moisture. You can add large amounts of good, balanced compost when gardening in sandy soil, up to 40% of the soil volume. This will give you a marked improvement in both water retention and crop yield in the first season, with continued improvement in subsequent seasons. But compost alone is the slow way. There are a couple of accelerators--bio-char and coir--that can shave a few years off your soil improvement efforts. Bio-char is organic matter, usually wood or coconut husk, that's burned at a low temperature, in a low-oxygen environment. The resulting "char" is ground into loose shavings that can be mixed into soil to soak up and hold moisture, and provide habitat for bacteria, fungi, and the soil food web. 1 tablespoon of bio-char has the surface area of a football field. This kind of surface area provides ample habitat for bacteria and fungi to work their magic, knitting a pile of tiny rocks (sandy soil) into soil that can sustain healthy, vigorous plants. Bio-char holds nutrients, not just moisture, in the root zone of plants. I've always had healthy, vigorous gardens, but in 2015, in response to the California drought, I started mixing bio-char into the soil before planting vegetable beds. Many of our gardens were facing 35% cutbacks in water, so we were looking for organic ways to retain moisture in the soil. We mixed Bio Char into the top layer of soil in every garden, and mulched heavily. Even with 35% cutbacks in water usage, we had almost no fall-off in productivity. Bio Char is even more effective in sandy soil than it is in our heavy western clay soil. I wouldn't think of starting a garden without it. The best thing about bio-char: It lasts for decades in the soil, and only needs to be applied ONCE. So while you're improving your soil dramatically, you're also sequestering carbon in the soil. Coir is dried, compressed coconut husk. A cheap and abundant byproduct of the coconut industry, it comes in brick-sized to suitcase-sized blocks. Coir is an ideal soil amendment for gardening in sandy soil. When soaked in water, each block absorbs 5 times it’s weight in water, and triples or quadruples in volume. Mixed into sandy soil, coir soaks up moisture, and holds it in the soil for a long time. It’s slightly acidic, just the right pH for most fruits and vegetables. Composed mostly of lignins, it breaks down very slowly, and can improve water retention when gardening in sandy soil for as long as 8 years. The lignins in coir feed and sustain beneficial fungi, which work in conjunction with bacteria to bind sand grains into a sandy loam soil. 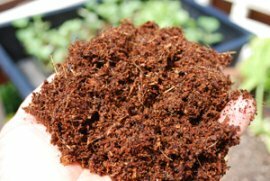 Why Use Coir Instead of Peat Moss? Dry peat moss is hydrophobic. Once it dries out, it actually repels water, as anyone who’s used it in a nursery mix knows. Coir is hydrophilic—it can soak up moisture even from the air, and is much easier to keep moist than peat. Peat moss is often extracted from peat bogs in an environmentally destructive way that damages wetlands. Peat moss is more acidic than coir. For acid-loving plants like blueberries, this is an advantage, but soil acidity is a problem for cruciferous vegetables, spinach, and lettuce. If you keep adding compost every year, by the time this “scaffolding” has broken down, bacterial and fungal populations will be high enough to maintain soil structure without it. Instead of gardening in sandy soil, you’ll be gardening in loam. Adding coir to sandy soil immediately increases it’s moisture-holding capacity. Populations of bacteria and beneficial fungi multiply, creating a virtuous cycle—bacteria create microaggregates that increase their habitat, and beneficial fungi thread their way through and around these microaggregates, increasing the water-holding capacity of the soil. Better conditions allow more bacteria and fungi to grow, and more bacteria and fungi create more food for protozoa, nematodes, and other soil predators that drive the soil ecosystem. See The Soil Food Web for more information on how this feeds your plants. To use Coir: Soak the block—or piece of a block, if you have a large one and aren’t using the whole thing—in a 5-gallon bucket of water. Be sure to drop the brick in so the long side faces up, especially if you’re soaking more than 1 brick. If you drop it in on end, it may swell against the sides of the bucket and you’ll have to hack it apart. Use about 1 gallon of water per block. After 10-15 minutes, break up any dry chunks. Mix coir into the planting hole for shrubs, trees, and perennial herbs. Use up to 20% of the soil volume removed from the hole. For established plants, apply a 2” (5 cm) layer to the surface and cultivate into the soil. To improve water retention in flower and vegetable beds, apply a 1-2” (2.5-5 cm) layer of coir to the surface with compost and other organic soil amendments, and cultivate in before planting. What if you don’t have access to “good” garden compost, but have ready access to municipal compost, animal manures, or other bulk soil amendments? Will these work for gardening in sandy soil? A Nitrate Depletion Period ensues whenever high-carbon materials are mixed into vegetable garden soil. Soil bacteria multiply to assimilate the new carbon food source, sucking up soil nitrates to fuel the growth of their populations. This deprives your plants of the nitrogen they need to grow, and lasts for a few days to a few weeks, depending on temperature, soil moisture, and how much carbon was added. Eventually, the bacteria use up the added carbon and start dying off. As they die or are eaten, the nitrogen bound up in their bodies is released back into the soil, where plants can use it. But the damage may already be done if your vegetables are stunted from lack of nitrogen at a critical time in their growth. The answer is a qualified “yes”. Most animal manures will help retain moisture when gardening in sandy soil—especially if they’re well-composted, and had a lot of straw or bedding mixed in before composting. Compost is trickier. Cheap compost and many municipal composts will help in the long term, but your vegetable yields might drop the first season, unless you take precautions. (See “Nitrate Depletion” Sidebar). Cheap bulk soil amendments and municipal composts often have too much carbon, relative to the amount of nitrogen they contain. Sandy soils have low nitrate levels to begin with, so nitrate depletion happens more quickly if you add a high-carbon soil amendment, and you’re gardening in sandy soil. To avoid nitrate depletion, materials added to loam soil should have a C:N (Carbon-to-Nitrogen) ratio of 30:1 or less. At this level, most vegetable garden soil has enough nitrate available to accommodate a rise in soil bacteria without compromising your vegetables. To avoid nitrate depletion when gardening in sandy soil, the ratio should be less than 25:1. Good garden compost usually has a C:N ratio in the range of 20:1. It provides a short-term nitrogen boost immediately, but it’s more durable humic acids break down slowly, acting as a sustained-release organic fertilizer throughout and well beyond the growing season. If you’re unsure of the C:N ratio of municipal compost or any other bulk amendment, add some supplemental nitrogen, like composted chicken manure, or feather meal when you incorporate it into the soil. See Improving Garden Soil for more information on C:N ratios and bulk soil amendments. See the manure section of the fertilizer page for the npk values of animal manures. Fix # 2: Mulch, Mulch, Mulch! Mulching is the second fix for gardening in sandy soil, and it compliments the first fix, increasing soil organic matter. Mulching is probably the most under-utilized tool in the gardener’s arsenal, but it’s one of the most important, for both sandy soil and clay soil. A good layer of mulch reduces evaporation from the soil surface and is one of the best ways to retain water when gardening in sandy soil. It keeps the soil surface cool, brings the microbial life of the soil right up to the surface, and provides habitat for the surface shredders—microarthropods like oribatid mites and springtails—that are so critical to the soil food web. Usually, UV, heat, and dryness nearly sterilize the top inch of soil, but mulch makes this layer warm and moist in summer, so the soil food web releases more nutrients for your garden. What is “a good layer”? 3-4” (8-10 cm) is good around the drip line of shrubs and fruit trees (keep it a few inches away from the trunk, but cover the rest). Under vegetables, an inch or so of fine mulch will usually do the trick. As an added bonus, mulching reduces weed problems, and when weeds do sprout, they’re spindly, weak, and come out of the soil with the slightest pull. Amend the soil with garden compost, bio-char, and/or coir to increase moisture holding capacity and boost bacterial populations. Mulch the surface to retain moisture and increase the depth of biologically active soil.